they are not related to the 'wood-warblers' of the Americas, nor the true warblers of the Old world. This name is Greek in origin and means 'born of sound', referring to their lovely calls (Cayley and Lindsey 2000). Gerygones are, along with the thornbills and scrubwrens, the classic 'little brown birds', and thus telling them apart can be quite difficult. All species are small, mainly with brown or grey upperparts, pale underparts, red eyes and usually with a small white 'eyebrow' or a streak from the bill and going over the eye. They make up for their dull plumage with their pretty calls, with some species creating a beautiful series of up and down notes. Many also build interesting, messy little nests that hang suspended off tiny threads (pictured). These are often built above rivers and appear as nothing but flood debris, thus earning them the common name of ‘floodbirds’. They tend to flit or hover around the foliage of trees, gleaning insects off leaves. There are 3 species that may commonly be seen associated with Australian tropical rainforests. 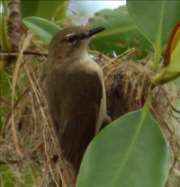 The Large-billed Gerygone (Gerygone magnirostris) and its nests are commonly seen and heard in lowland rainforest (and mangroves).